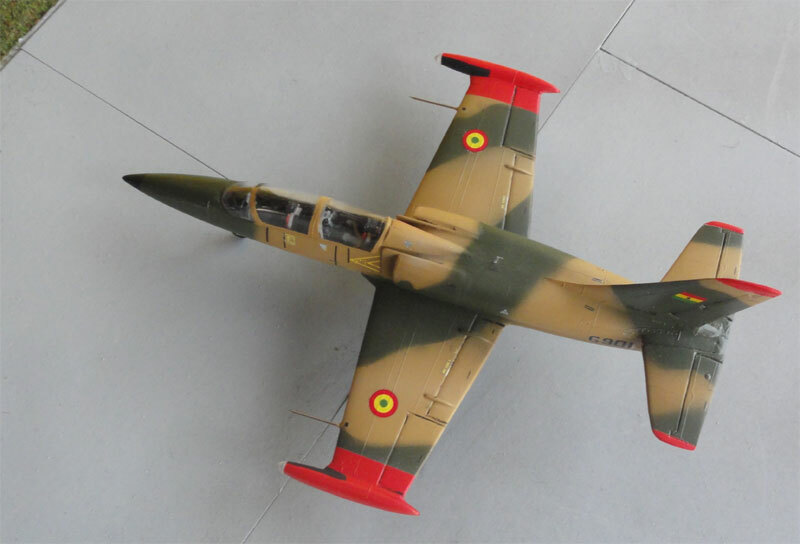 Several L-39 Albatros models will be made using the KP kit. The canopy was to be set closed using a PAVLA clear vacu canopy after the kit got PAVLA resin seats. First various yellow panels were airbrushed using Revell Aqua 12 "gelb" on a mat white base after these were masked using the Harder Steenbeck and masking was needed. All other colours were airbrushed as well. The anti-glare panel on the nose is mat black. The model was made "clean" without any tanks nor armament. It is mostly seen as used for jet training. 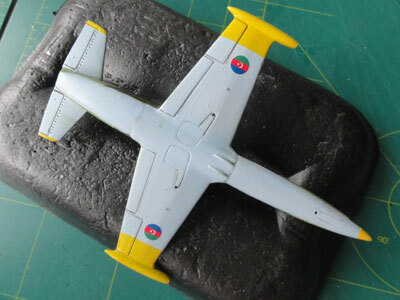 A few decals (also from the various sheets such as from the Eduard kits) were applied after the model got a gloss varnish coat using Future with the usual technique. 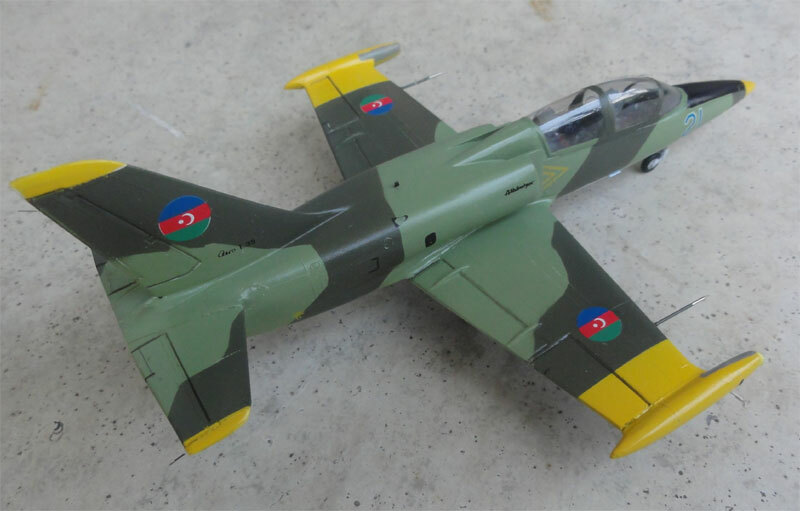 Azerbaijani roundel decals came from Begemot decal set 72-032 for a MiG-29. But the national roundel colour banner should be reversed as well as the hammer, so some cutting was needed; it can be done however using Begemot decals no #60 + 61. Photo below shows that the green roundel areas face outboard. The nose code came from the spares box. The landing gear from the kit was installed but the two pitot tubes on wing leading edges replaced and made from metal needles. Static dishargers were also added made from flexible fishing wire at the horizontal stabilizer tips and rudder. Fishing wire is a bit more flexible so is less vulnerable. The bits of wire were fixed with super glue and painted black. Anti-collision lights (red and dark blue) were painted on the wing tip tanks and got a drop of Micro Kristal Kleer to suggest a light. 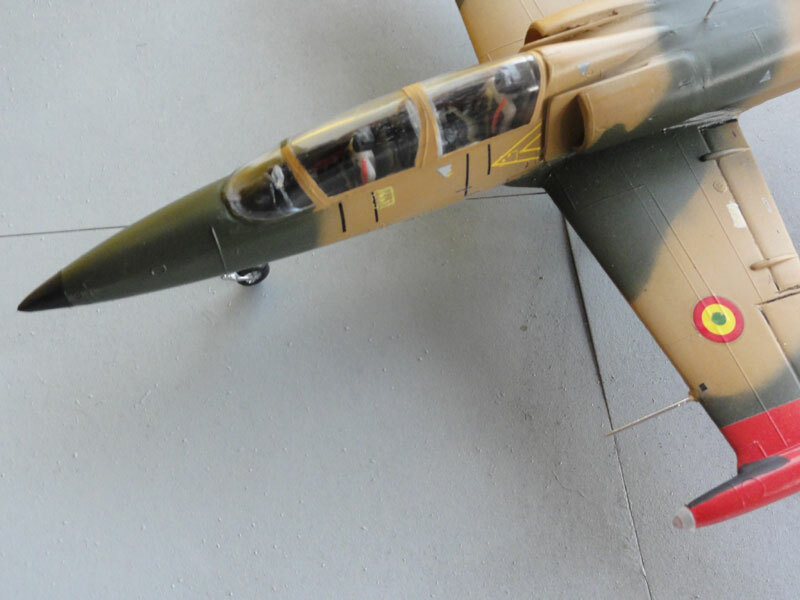 A light grey anti-glare panel was added on the wing tip tank inside faces. 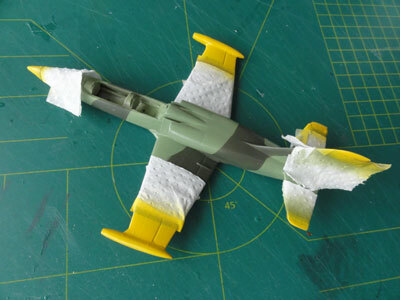 Made from thin plastic card, some smaller antennas on the spine and lower aft fuselage were set in place. On each canopy a fixed handle is seen so 2 in total on the port left sides, these were made from thin sprue. Finally the model got a semi-matt varnish clear coat using a mix of Tamiya Flat Base and Future with the usual technique. 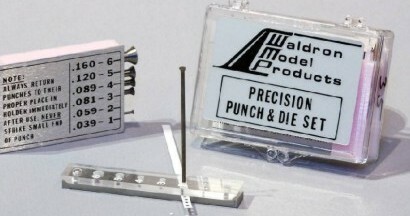 That completed the model. 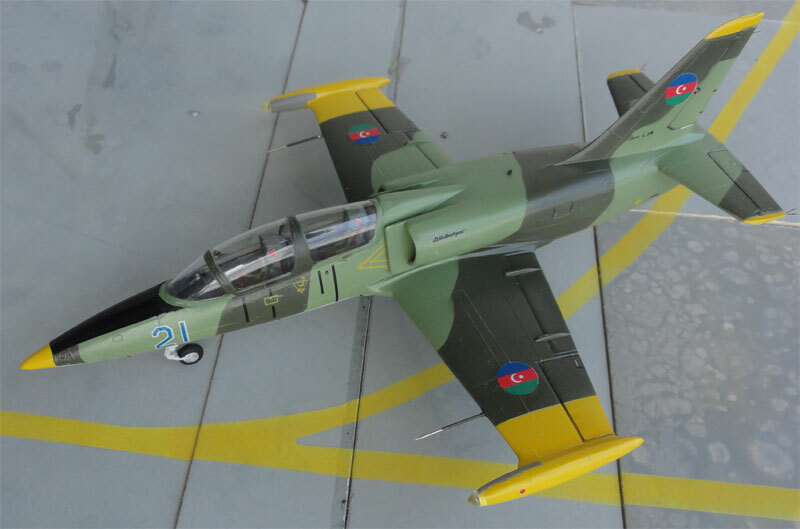 The Azerbaijani air force (AzAf) was re-established after the country became independent in 1991. 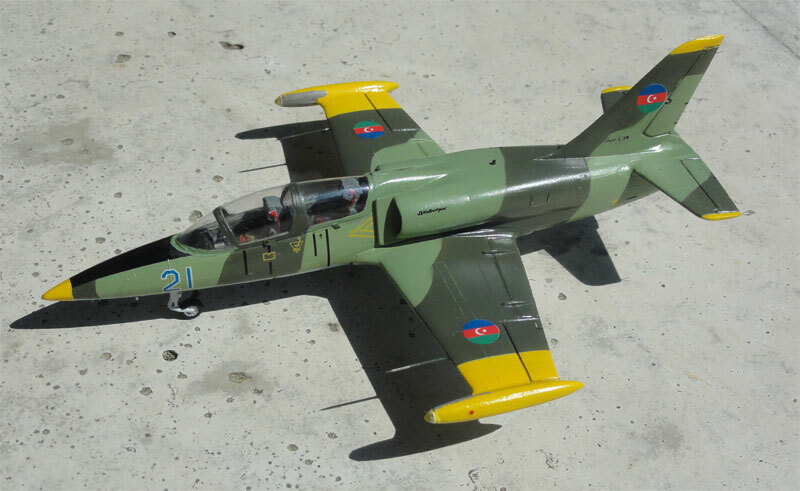 Before that, during the Nagorno-Karabakh War in the 1980s and early 1990s some L-39 aircraft were used for ground attack. 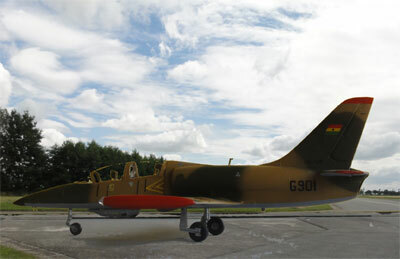 Nowadays the country has a couple of dozen L-39 aircraft which are used as trainer. Russian aircraft types like the Su-25 and MiG-29 are in the air force as well. The canopy was set closed. For the colour scheme: first the red panels were airbrushed on a white undercoat after masking using Revell Aqua 330 "feuerrot" acrylic. There also black anti-glare inboard panels on the inner wing tip fuel tanks were added, painting those by hand with a brush. I could not clearly see if an anti-glare panel was on the nose so did not apply this one. 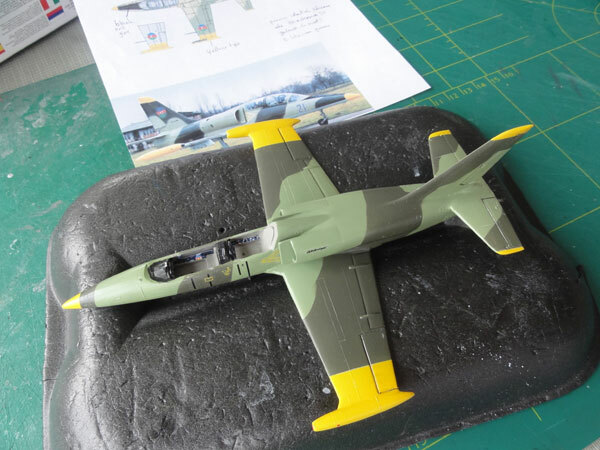 A GSh-23L 23 millimeter twin barreled cannon was added using resin of set 72-002 from MIKU (but also the Eduard L-39 kit has it). Markings came through decals from various sources: the yellow intake warning triangles came from Aztec set 72049; the roundels were made by combining Spanish roundels with green dots punched from decal with a Waldron Punch and Die set. The tail flag was made from strips of coloured decals. The registration G901 came from the spares box. Other kit finishing was similar as described above. Final installment was the undercarriage as well as some smaller antennas. That completed the model. 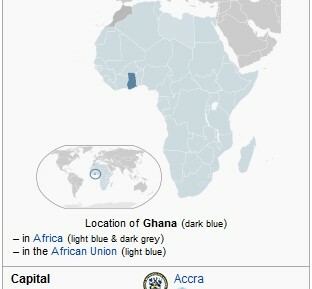 The Ghana Air Force (GHF) was established mid 1959 with instructors form Israel and it appears that even Hanna Reitsch (Hitler's personal pilot) started the gliding school in 1962 in Ghana. In the beginning, mainly British aircraft were used like Chipmuncks, Beavers and Otters as well as some transports like Skyvans, Caribou and Hawker Siddeley 125. Probably from 1989 Aero L-29 Delfins were delivered. 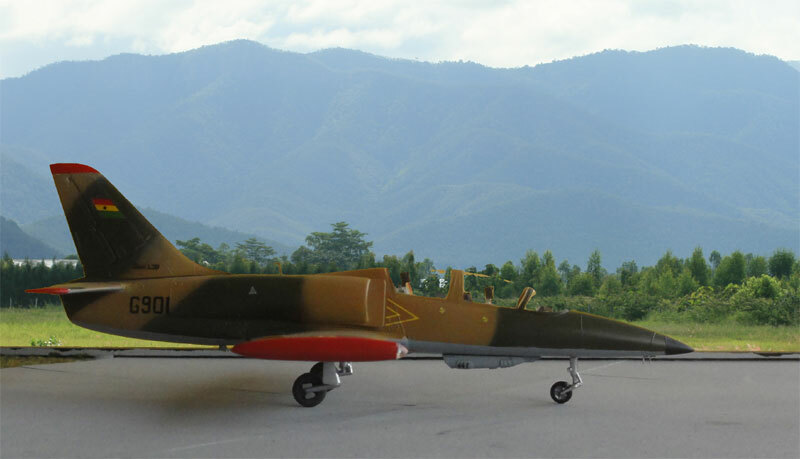 Later from probably 2000 two L-39ZO aircraft were purchased and used by no.4 squadron but these are now retired, the K-8 being used. 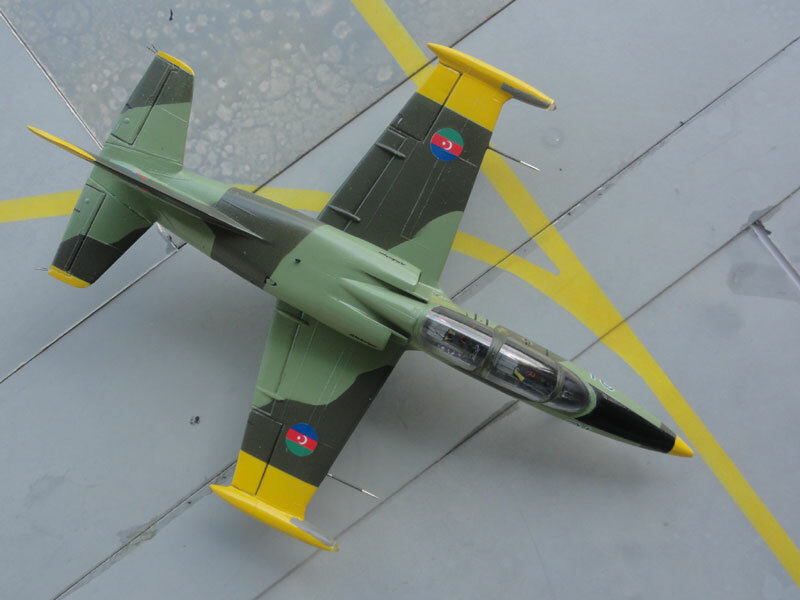 Currently the air force has no real fighter nor attack aircraft but it had Aermacchi MB339 aircraft until 2014. 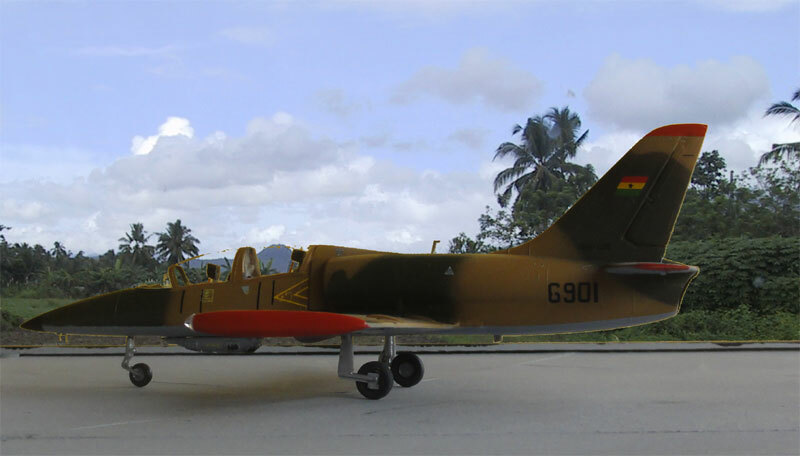 Some Mil helicopters, K-8 trainers and a Fokker F27 as well as some other utility aircraft are now in the inventory. 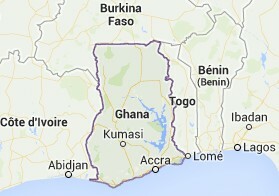 The main GHF base is at Accra, close to Kotoka international airport and other bases are at Takoradi and Tamala.